I want a good environment for parkour heroes. This pic is a little dated, but it shows a great place to run around in. 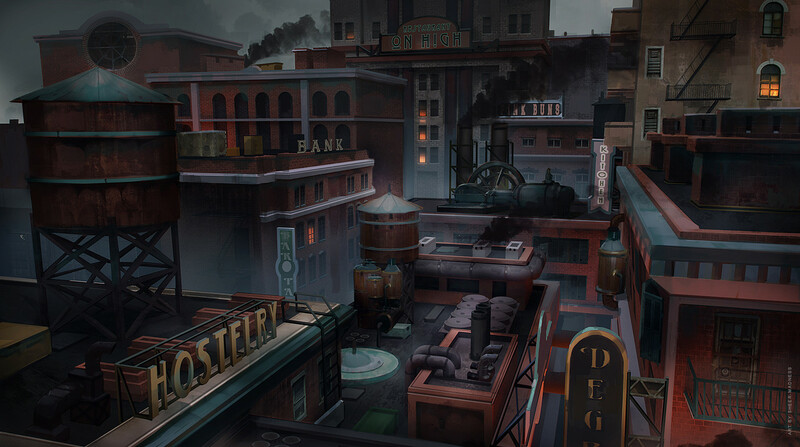 Many rooftop levels, deep falls, lots of interesting places to fight in. This just screams for a parkour, or a Spiderman type hero to play around in. --- Further, we need AI super villains (with the same movement powers) to populate this particular environment. The Lizard was an equal to Spidey in the wall crawling department. This might be a great place to suggest villains for COT to use. The Ferret is a martial arts expert. The Hawks (a gang): also addicted to high rise burglary. Their territory is the rooftops leaving the streets to lesser gangs. Parkour. They prefer ranged combat and use guns with knives for a back up. The Carrion Crow: He is winged hit man for hire. He is a grotesque, transforming from human to a winged monster at will. This is his preferred hunting ground. His hands grow into wicked claws. Parkour and Flight. So much yes! But don’t forget NPC heroes for those parkour PC villains to go up against! I think everyone has fond memories of jumping around rooftops in the slums of king's row. I hope there is plenty of that as well. I would want to add one thing though. Physics attacks in games are hilarious already but when you throw in an environment like this you have huge potential for fun. Everyone remembers punching and throwing bad guys off of rooftops as a fond memory from early CoX (I think they nerfed falling damage in general later in a few ways?). If too many of the bad guys don't fall to their doom when you kapow them off a roof then you've effectively removed that enjoyable aspect. Though you could always have wall crawling bad guys hang out on windows, fire escapes, clinging to walls, etc. And flying bad guys hovering in empty space. Since everyone has at least a basic range attack you can always grab them there right? That would leave room for more generic mooks on rooftops proper perhaps. I just really want to be able to boop bad guys off rooftops. It is fun. Same as we need way more airborne villains than CoX and CO had. Skies are always so peaceful. Everquest Next had a good Parkour engine. You could see it a little bit in the following clip. One of the things I really despise about some games is that curbs can stop you from moving forward (I'm looking at you Skyforge). A Parkour engine takes a look at the obstacle in front of you and if you are still pressing the forward movement button, it will begin an animation that moves you past the obstacle if you have the skill for it. Seems pretty simple (yes, I know nothing is ever as simple as it seems). All sorts of animations can be introduced from vaulting to three point corner climbs, you name it. I hope for super speed parkour!